A fabulous cool to hot growing micro-miniature species of Dendrobium bearing large 1 ½” long-lasting waxy flowers ! 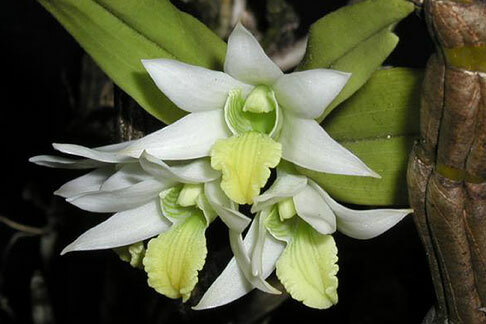 Endemic to Laos and Thailand, this species flowers from winter through summer on short inflorescences on its leafless canes, each inflorescence producing 1-3 fragrant ivory flowers beautifully accented with soft lime green lips. For best flowering, give the plant a cooler and drier winter rest. At the onset of new growth in the spring, resume generous water and fertilizer along with the season’s warmer temperatures. A showy miniature and Highly Recommended !